As you may have noticed, there was no post on Friday. I wish I could say that I have a good excuse for that, but I don’t. My excuse is that I forgot it was Friday. I told you it wasn’t a good one. I feel like there should be some sort of punishment involved for this crime, but it’s hardly fair for me to pick my own punishment. So, I leave it to you: how can I made amends? Should I write a crappy fan fiction piece? Should I put on a costume and try to engage strangers in conversation? Should I read a particularly boring book? Let me know. And if no one makes a suggestion, I suppose I’ll just have to punish myself, but I’m probably going to let myself off the hook, so you should all really get on this. Fridays will change. Instead of posting a random creative work on Friday, I will post my word count for the week. The goal is to finish a chapter a week on BotG until I have an entire rough draft. If I haven’t finished a chapter by Friday, I have to post a poem written in my youth. I don’t want that, and neither do you (even though you will probably find them hilarious), so let’s all hope I get on this properly. On weeks that I do finish the chapter, I will write about an issue I’m having with the story and try to relate it to whatever the topic on Monday was. And we will all live happily ever after. I promptly read the entire thing (it’s not very long), and have already ordered three of the other books in the series, which is called the Canongate Myths Series. Basically, the idea is that popular modern authors take on old myths and adapt them in a new way, for a modern world. Philip Pullman, Victor Pelevin and David Grossman are among the other authors who’ve contributed to the series so far. 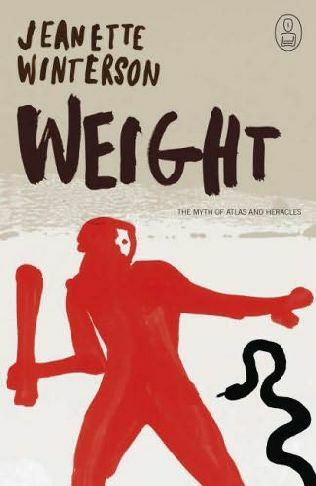 In this particular book, Winterson talks about the myths of Atlas and Heracles, and ultimately ends up talking about the idea of fate, and how difficult it is to get outside the life that’s been set down for you. While I don’t love or agree with everything Winterson writes, she’s a fabulous author and the book was downright fascinating. I would highly recommend it, especially to mythology buffs like myself. When the other books get here, I will likely be reporting on them, too. In the meantime, I’m reading “Starship Titanic,” written by Terry Jones and based on a story by Douglas Adams. Really, I don’t know why it’s taken me this long to get around to it. P.S. Haven’t heard back on the job yet, but staying hopeful. But also looking for other options. Can’t be too cautious, right?